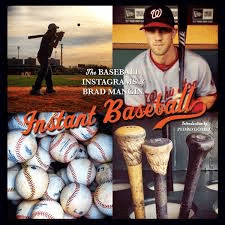 Instant Baseball: The Baseball Instagrams of Brad Mangin is in a league of its own. The 161-page book can’t be judged by its cover. The book is a 6-1/2 inch square, first resembling a children’s “board” book. Inside is a love-it-or-hate-it creation. This title will evoke strong emotions in everyone. For me, the first reaction this frequent Sports Illustrated photographer received from me was bafflement. Yes, there’s 240 images coveraging the 2012 season. Mangin is a Bay Area photographer who can cover all teams through his Oakland/San Francisco proximity. Mangin writes a three-page introduction, telling how he made all the photos with his Apple iPhone and the Instagram app. There’s even a brief mention that Bryce Harper loved the innovative look of Mangin’s Instagram images. The young outfielder agreed to pose after BP, even changing into his game uniform early. Here’s where the book disappoints. The stories end! There’s NO captioning of each photo. The first 20 pages of photos get oh-so-brief captions on page 21-22. Ironically, the most reporting Mangin does is when he photographs photographers. He points out that it’s Robert Beck photographing Albert Pujols for Sports Illustrated. Then, the book layout cheats some of Mangin’s best pictures. Four pictures on one page? That’s smaller than a baseball card. And even baseball’s most artful set ever, 1953 Bowman, provided details on ALL the card backs. We didn’t have to wait for a checklist card to reveal the photo details. Mangin does have a sense of humor. On page 77, he shoots from a low level, showing Fox TV reporter Ken Rosenthal stretching his mike to reach gigantic-by-comparison Brave Jason Heyward. Sure, there’s lots of artful images in Mangin’s book. However, how many of you want to watch a televised game without any sound or captions? Fledgling photographers could find inspiration in these pages. Or, fans of the Giants and A’s might like the extra peeks at their favorite teams. For me, I want more. How do you convince a current major leaguer to hold still for a 10-second pose? Mangin has seen so much. I’m sure he has a collection of amazing stories. Even two sentences about each photo would be an incredible treat. Instant Baseball could grow on you. For me? I’m ready for a sequel, hoping for more stories behind the shots.